A good way to start the day--or, for a break in the middle of the day--or, even, to end the day. Yes, thinking of things that are good in your life is a just a good thing anytime. 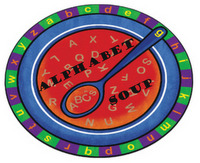 Alphabet Soup is the brain child of Morning Glory over at Seeds From My Garden. Go on over and see what she has for you today. I love KNOWING that these K things are in my life and plan to KEEP them around as long as possible. Kevin--Our younger son. Kevin and his family are delightful! We love all of them dearly! Kevin is also the "money guy" for us. Having a CPA in the family certainly comes in handy at tax time and when we have other money related questions. This is also amusing to his Dad and me. At an earlier time in his life we would never have seen him in that role! I'm just sayin'! BTW, you can meet his wife, Holly, at Soccer Mom. Knowledge--I have always loved learning! There were times in my life when others would never have guessed this! I had TOO MUCH FUN! in High School and Freshman year in college for people to see me as a serious scholar! :-) But the learning bug did take hold later--I even went so far as to get a doctor's degree (Ed.D)! I know, I know! Why?! Well, I wanted to. AND--There was a great scholarship attached to it. Kookies--Yeah, some one who loves knowledge should know how to spell better than that! But kookies (cookies) are good--especially chocolate chip ones. Kisses--Yep, I can't leave those out. Of course kisses from the husband are nice--but I love those little grandchild kisses, too! Kicks--I have spent many hours watching little children (sons and grandchildren) kicking a soccer ball. Fun! Fun! I don't get to go to the games as much now, but we enjoy the videos the parents occasionally share with us. Nothing like watching children learn what competition is all about--and how to play on a team. Kids--Naturally, I love my kids and our grandkids! However, I had a professional career that was dedicated to kids--and knowledge. What a combination! There are not many things in life more rewarding than watching, and helping, a child learn! What K things are in your life? Why not share them with us. Leave me a comment so I can come to your place to read your list. Also--Be sure to let Morning Glory know you're joining in. She'll definitely want to come read your list. For me, Halloween is all about children having fun. Our neighborhood does not have through streets or a lot of vehicle traffic--just the people who live here. Actually there is no reason for anyone to cut through the neighborhood--You would just end up in the lake on one side or the woods of a restricted reserve and National Historical Landmark on the other. Which, of course, makes it the perfect place for trick-or-treating. We have lots of little ones who come by for candy. It is not unusual to have over 130 kids between 6 and 8 o'clock. There is a carnival atmosphere throughout the neighborhood. Families with children in wagons, a few decorated golf carts, and a couple of flat bed trucks with loads of kids--in addition to the groups walking with flashlights--are likely to be here. I close the door and turn off the light when it is obvious that all the little ones have gone home to bed. I'm not really into giving candy to older teenagers! So--I've got to go get the candy ready for the big night! The weather is supposed to be dry and cool, but not cold. Which means--I better be ready for 'em, cause they will be a comin'! Have You Been to a Pumpkin Patch? Pumpkin patches are all over Bloggetyville lately. Have you noticed? Children and their parents are looking for the perfect pumpkin. Of course, perfect is in the eye of the beholder. It might be a huge one, or a little one; a skinny one, or a fat one; a bright orange one, or an almost white one. Everyone has their own idea about what is perfect! After you find the perfect pumpkin you have to decorate it. Then the fun really begins! I haven't been to visit a pumpkin patch this year. Actually, it's been several years since I picked out a pumpkin for carving. However, I realized that I have my very own--albeit small--pumpkin patch. Come, take a tour with me around my little "punkin patch." Here's a cute little vintage Jack 'o' Lantern that I got in the Holiday swap at PEA's this year. Cute little guy isn't he? Standing watch over some tissues--just in case you might need one! They have jacks on them, too! The guest bathroom would not be well dressed without a little seasonal deco. Right? This fellow as been with me for several years--gift from a friend. He looks sort of friendly/scary when he has a little tea light candle burning inside. Time for a refreshment break! The little Jack that is standing watch over the cookies is a teacher gift I received in 1987--It says so on the back. Oh! You say you don't see him? Look carefully--He's there right behind the Chocolate Chip Cookies! Better watch out when you get one--He looks a little sneaky! Now for some beauty! I believe these are the pick of the patch! The floral wreath was a recent gift from a dear friend. I had the glass vase and the small pumpkins and gourds already. I thought they made a good combination for the dining room table. Thanks for visiting my little pumpkin patch! What kind of pumpkins do you have this year? If you don't have a patch we can fix that. You can have some fun with this one! I am so far behind on reading and posting--I may have to reintroduce myself! I will be around to talk to friends as soon as I can. I appreciate the emails and comments I have received from some of my blogging friends checking up on me. Thank you for caring. • I won an award! Kelli at There Is No Place Like Home Who doesn't love Show and Tell?! I also enjoy Kelli's pleasant and gracious way of inviting us into her home. There is always something lovely to see and admire! AND--She lives in the great state of Texas--can't get any sweeter than that! Becky at The Butler's Wife Becky is truly one of the sweetest people I know--Blogging and IRL. She is kind, generous, and creative. On top of that, she cares about the environment! Her blog reflects all of that and more. I'm proud to call her friend! • I got great mail! I received one very special package. I feel a badly that I haven't shared it with you yet. In fact, I thought I might show you, in this post, the beautiful table runner that I won at Becky's giveaway on her 200th post. However, I have decided it deserves its own spotlight. I'm going to save it for Friday's Show and Tell. I know, I know, that makes it even longer that I will wait to share it. Please forgive me, Becky! It will make a perfect Show and Tell because I plan to treasure it always. Come back Friday! I decided my quiet mode was perfect for some reading. I used the time to do some of the reading on my Fall Into Reading list. I finished Exile, by Richard North Patterson. What an involved story! The storyline was intriguing and complicated. It also provided me with new insight into the conflict between Is*rael and Pal*esin*ians. I will leave the in-depth review of this book to someone else. I do recommend the book, both for the story and for the historical and political aspects. Although the story is fictional, the background information is very revealing and educational. After that heavy reading, I turned to some--shall we say--"chick lit". Yes, I read rather eclectically! Debbie Maccomber is good when you are in the mood for some basically light reading with characters that you can love, or --in some cases--just want to know what they will do next. I don't love Will Jefferson or Warren what's his name, but it is interesting to see what foolish thing they will do next. The main characters--like Grace, Olivia, and company--are the ones you come to love. I like reading a series all the way through from beginning to end. I had not read any of these, so it was a journey from beginning to--not the end--but, the end of the story as it has been published to this point. I'll have to wait, with everyone else, until next year for the next installment. • I started the never ending closet project. I'll do a post on this before long. I decided my closet needed a really good cleaning. It really did! I mean, who really needs about a million ugly black purses! Anyway--one thing has led to another and it took me longer than it should have to get things back in order! But--the results should be worth the effort! • I enjoyed Bible Study. The group of women who meet at my house on Monday nights is precious! We are having the best time with A Woman's Heart. I am woefully behind on my Bible Study posts about on the blog. I will be doing catch-up in just a few days. Luke and Ella have been over a few times--along with their parents. Luke comes after school a couple of days a week. He and I get started on his homework; sometimes we play games. He comes through the door asking for ice cream. Some grandmamas bake cookies--I make sure there's ice cream in the freezer! I'm thinking it is about time for a visit from the other grandchildren--Looking forward to that! • I spent time with husband, Lee. An up-date for some of you Lee followers--yeah, you friendly lurkers are included! He is doing OK. He has recently had some lack of energy issues, but is doing somewhat better now. He also continues to have heavy congestion problems. That is an ongoing aspect of his condition and we have learned many ways to deal with it. Lee also--as always-- enjoys visits from friends. If you are in that large group of people, you are invited to come by. If he is not up to a long visit we'll let you know. If you know Lee, you know he is going to be doing something to advance the Father's Kingdom. Since his retirement he has been doing some volunteer writing for a mission effort called Christ to the World. He writes radio scripts that are translated into other languages and broadcast in Asia and Northern Europe. He has recently been able to complete a couple of these. 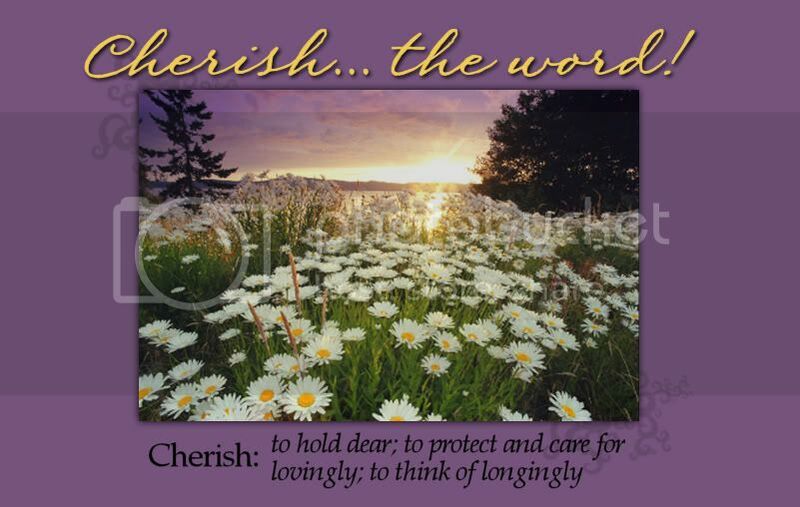 Lee wants all the blogging friends to know how much we appreciate your kind comments and promises of prayer at the loss of his mother and my brother. We really have felt lifted up. Thank you from both of us! So there you have it--I told you it was a quiet time off. Just life! It's good to be back at the computer and I look forward to getting around to all my friends. See you soon! 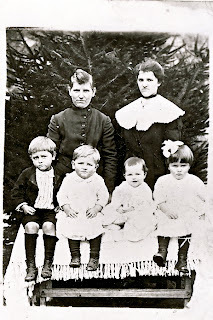 In the picture above Emma is the youngest child--third from the left. The other children are her sister, WaDena--on the end with the bow.The little boys are her uncles. The two women are her grandmother, on the left, and her mother, standing behind Emma and her sister. Her grandmother and her mother died in the flu epidemic of 1917. Emma was raised by a series of foster parents and relatives. This picture shows a constant with Lee's mother. She always had her Bible nearby. She read and studied it often. For many years she shared her love of the Lord and His Word by teaching women in Sunday School. Mother, Grandma, G-Ma--Take your pick! Here she is with the people who love her best! Younger son, Lee is sitting next to her. 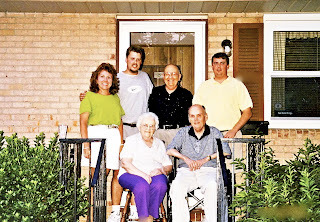 Standing are: granddaughter, Becky; grandson, Greg; older son , Jack; and grandson, Kevin. Greg and Kevin are our sons; Becky is Jack's daughter. Emma loved her children and grandchildren! All of them are in this picture except Ella, who was born the next year. (I know there is a picture of a six-month old Ella with G-Ma, but it is hidden in the boxes of Family S photographs. When I find those pictures I will edit to include all!) Standing in the back is Becky, Greg, Jack, and Kevin. 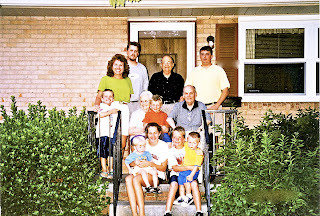 Middle row--Connor, standing next to G-Ma; G-Ma, with Joshua on her lap, Lee. Sitting on steps--Isaiah (Spoony) with Nicole, and Luke with Hunter. Nicole, Hunter, and Connor are Becky's children; Joshua and Spoony are Kevin's, and Luke and Ella (not yet born at this time) are Greg's. Because of Lee's illnesses and G-Ma's increasing frailty, travel has been impossible. 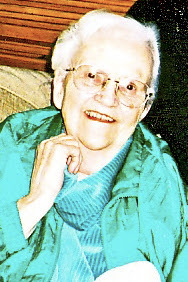 The last time we saw her was when we gathered to celebrate her 90th birthday at Thanksgiving, 2004. Of course, Lee cannot travel to North Carolina for the funeral. Greg and Kevin have gone to be with Lee's family. to tell friends and family about her passing. My mother, Emma, S., passed from this earth to be with the Father about 8:20 CT Thursday morning. She had suffered with pneumonia and other painful ailments during the past several days. We are thankful she is with the Lord and no longer in pain at this time. 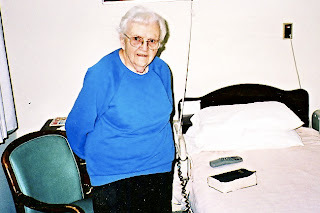 Mother would have been 93 next month and had enjoyed nearly 70 years of Bible teaching. Her missions and ministries were many; her love of the Lord supreme. In addition to my brother, Jack, and me, Mother is survived by two daughters-in-in-law, three grandchildren, and seven great-grandchildren. Services will be at Cumby Funeral Home in High Point, NC, at 2:00 p.m Sunday. Graveside services will be at 11:oo Monday morning in Bluefield, VA. Please pray for our family during this bittersweet time of her home-going and the loss of her presence with us. 1Do not let your hearts be troubled. 2In my Father's house are many rooms. Sometimes a girl needs a little quiet time! but I don't plan to post for several days. I try to get my Bible Study post up early on Wednesday. I just haven't finished it--Life, you know! will be up later today. at my Alphabet Soup list in the post below! Alphabet Soup is the brain child of Morning Glory over at Seeds From My Garden. You can run over there to get the scoop. It's easy! Insurance--If you haven't signed up for disability and other "extra" policies (like the one with the animal that says, "quack") available through your work--please rethink that decision! Having those policies has meant a world of difference to my husband and me during his disabling and devastating illness. Until our country has a better way of paying for health care I'm glad to have good insurance! I'm not going to get on a soapbox--I don't pretend to know the answer--I just know there HAS to be a better way! Ice Cream--Some grandmamas bake cookies. I just make sure I have those little individual cups of ice cream--in chocolate and vanilla! My grandson, Luke, comes through the door asking, "Do you have the kind of ice cream with the cows on it?" That would be Blue Bell, thank you very much! Insulation--Keeps us cozy in winter and not quite so hot in the summer. Ice Maker--I remember ice trays? Woe be to the person who put one back in the freezer without water! i*P*d/i*Ph*ne--I have an ice maker, but not one of these. Do I need to come all the way into the twenty first century? Do you have an "I" or two in your life? Let us know in a post or comment. Morning Glory would love to know you if you make a list. A LITTLE HALLOWEEN SWAP FUN! Don't you just love to get packages in the mail? I don't normally make a big deal of Halloween. Except, of course, for the handing out of the candy at the door. We live in a neighborhood that does not have busy, through streets. Therefore, LOTS of people come to Trick or Treat down our street. It is not unusual for us to have 100+ little revelers. We have a friendly, neighborhood carnival atmosphere for about three hours on Halloween evening. I enjoy passing out the candy and telling the little ones how precious they look. 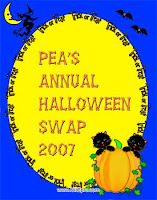 ANYWAY--When I saw PEA's Swap I thought it sounded like fun. I have not done a blogging swap, so I thought it would be give it a try. I have enjoyed putting together some little treats for my "swap friend." She has not received the package yet, but should in just a day or two or three--It's on its way, Michelle! Today I received this sweet package in the mail! My "Swap Friend", Julie Marie, even decorated the box. Inside, the first thing I found was this cute little cat! Ella, to leave him at my house. The treats just kept coming! This cute little Jack-o-Lantern fellow was next out of the box. He had a mischievous grin on his funny little bobble head! I found this nice Halloween tray. I will be filling it with brownies later today. wishing me a Happy Halloween! "sniff, sniff" tissues for the sniffles! Thank you Julie Marie for brightening my day! 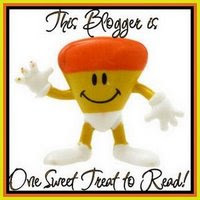 It is fun, and now I have two new blogging friends! the other lives in the southwest. Isn't the blogging world great?! Can it be Friday already?! It is, and that means it's Show and Tell time! Go on over to Kelli's to get in on the fun. My Show and Tell this week is a pen and ink drawing that hangs in our family room. Of course, it has a story! When we moved to Tennessee in 1971, Lee worked as assistant editor of Home Life, a magazine which does just what its name implies, supports life in the Christian home. After a couple of years Lee left Home Life and went on to other positions and responsibilities with his employer. However, he did occasionally write articles for that and other magazines. One of those articles was about our boys, their dog Muffin, and her babies. The name of the article was "Muffin's Babies." Muffin was a border collie mix--probably a little Spaniel and something else. We found her at the Hum*ane Society and she was a sweetheart! We didn't know her background because she was a lost or stray dog. She had been well-trained and was very affectionate--one of the best natured dogs I have ever known. She was about two years old when we got her and she was our dear family pet for about four years. Muffin died--of kidney failure--not long before Lee wrote the article. Our family had been devastated at the loss of our beloved pet. In the midst of missing Muffin, Lee and I realized that, through her, our boys were learning yet another life lesson. She had taught them so much--joy, caring for someone else, responsibility, and even the birth process. Lee's article focused on how Muffin had helped our children learn so many things about life in such a natural way. He did not; however, go into detail about how Muffin came to have seven puppies. Seven puppies, that, BTW, I had to find homes for! Here's how that little story went. Kevin, age three, came in and proudly announced, "I opened the garage door and let Satan in because he wanted to see his friend." Yes, Muffin and SATAN were friends. Satan was a black lab who had CLIMBED our four foot fence to try to "visit" Muffin. Muffin was in confinement--ahem!--in our garage. Of course I rushed out to the garage. AND, of course, I was too late. A few weeks later we had puppies! Muffin not only taught our boys lessons, she taught the parents a lesson. As Bob Barker would say, "Have your pets spayed and neutered!" We did! The artist who did the art work for the article gave Lee his rendering of the picture. I had it framed for Lee's birthday and it hung in his office for several years. Later it came home to hang in our family room. One interesting thing about it is, that even though the artist did not know our boys, he came very close to capturing them in the picture--especially the younger one. It really looks like Kevin at that age. I was sent this in an email recently. I decided to use it as a Meme and send it on to you! I'm Really OK Right Here; But--I'm Just Sayin"
4. Principals Meeting--Oh, Yeah, I don't do that anymore! Yippee! I tend not to tag specific people very often. Don't want to limit the fun, don'cha know! Let me know so I can come over to see your list. It's time for another session of Fall Bible Study. We are studying A Woman's Heart:God's Dwelling Place, by Beth Moore. You can go here to find the guidelines--which BTW, are intended to give several options for you to participate. I know there are several people reading along with us and that is great. However, I do I hope that today someone will link up and give us your thoughts on the week's study--particularly if you are using the books and doing the homework. And--I must say this week's homework was easier! We got a little behind the planned schedule when I had to take a week off--We completed Week Two in my at-home Bible study group on Monday, so that's where we are on the blog. If you post and link you might want to adjust to that schedule for continuity sake . But, you can, of course, just go with the week you are working on yourself.  Feel free to grab the button above for your post. What a great time we had on Monday night! We were a smaller group than usual but we didn't let that keep us from enjoying the fellowship and study. Hopefully, the missing friends will be back next week. In order to focus on what the Israelites were experiencing and where they were, we looked at a couple of maps and some pictures. Let's take a look. Here is a map of the the entire Exodus experience. Click on the map to enlarge it. There is another map (black and white) here that shows the Exodus journey. A book that I had available for our group Monday night is Holman Book of Biblical Charts, Maps and Reconstructions. I recommend this book if you are interested in adding to your library of Bible study aids. I shared with my group some pictures from a trip to Israel that my husband and I were blessed to be able to take in 2000. The desert that I saw on that trip is not where the Israelites were; however it looks similar. The Israelites were in the Wilderness of Sin (Exodus 16:1) on what we would call the Sinai Peninsula. 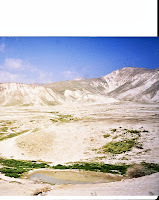 My pictures were taken on our trip from Galilee to Jerusalem and in the area near the Dead Sea. Because Israel is not a really large country, these places are relatively close in terms of miles. It will give you an idea of what the Judean desert is like. Check the maps provided above above for reference points. Click on the pictures to enlarge. These pictures show typical scenes on the trip from Galilee as you travel toward Jerusalem. This is a scene near where the Dead Sea Scrolls were found. Note the caves and holes in the side of the hills. There are many openings throughout the hills--very rugged and somewhat treacherous. Another shot showing the ruggedness of the Judean desert. Just imagine traveling over this land day after day! What a journey the Israelites had! One last picture for this week. I did not take this one. 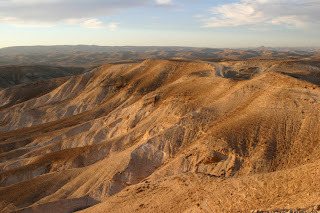 It is a view taken in the area known as the Wilderness of Sin where the Israelites were traveling. Note the continuous hills. Not a flat desert at all! This is the backdrop for all that the Israelites were experiencing. This is my personal reflection/review/summary of Week Two of A Woman's Heart, by Beth Moore. As she always does, in this week's lesson Beth leads us through many scripture passages and gives us much food for thought. She helps us to explore connections between Old Testament and New Testament passages. This is just a review/summary. I cannot begin to give you all the meat of that in-depth study. I encourage you to get a book and study along with us if you not already doing that. It is proving to be a rich and rewarding time in The Word. We will take a look at Beth's "principal questions" as the structure for our review. You can find these on page 30 in your study book. 1. How would you describe the physical surroundings of the wilderness? The pictures that we have already looked at gave us a pretty good idea of the physical barrenness of the desert. There were endless miles of rock, hills, and bare land. But within the relationship between God and His people we also see physical, visual means by which God revealed himself. God gave the Israelites some very special, obvious, and vital physical elements as they traveled in the desert. They had constant visual manifestations of the presence of God. Exodus 13:21-22 tells us how God led the Israelites by day as a "pillar of cloud," and gave them light by night as a "pillar of fire." Furthermore the pillar of cloud came between the Israelites and their enemies (Exodus 14:19-31). Just as God physically came between His people and the Israelite enemies in the desert, He is with us to give us the same protection and security (Psalm 139:1-6). 2. How did God make the bitter water sweet? Can you just imagine traveling in the dust and desolation of a desert days on end? Water would certainly become one of your most treasured possessions and something for which you would constantly search. Read Exodus 15 for the story of how the Israelites were experiencing great thirst and in need of refreshing water. Finally they found water! Alas! It was bitter! Once again God provided for their need. He directed Moses to throw a piece of wood from a tree into the water. When Moses did as God directed, the water became sweet. I can almost feel the cool quenching of a parched throat as I envision the Israelites enjoying that wonderful water! Beth leads us to compare what Christ did for us to what God did here for His people. Our sins (the bitter water) were forever forgiven by the sacrifice of Jesus on the cross (wood from a tree). We are offered the eternal life (sweet water). What an amazing God! 3. What did the Israelites long for in the desert? Have you ever looked back on a time in your past and yearned for the "good old days"? Unfortunately I have to admit to some "grumbling." How about you? That is what happened to the Israelites. They "grumbled" because they were missing what they had in Egypt. They talked (Exodus 16:1-4) about wishing they had never left Egypt where they "sat around pots of meat and ate all the food we wanted" (v.3) . They longed for a place they once yearned to leave! Beth helped us connect the story of the Israelites to our own situations. How can we reclaim joy in the Lord if we have allowed our spirits to stray--By seeking a close relationship with Him! 4. What lesson did the manna demonstrate? Now, friends, I just have to tell you this is when this week's lesson got personal! Exodus 16 is the story of God sending manna to the Israelites in the morning and quail in the evening. He gave them very specific directions about how to gather the food and prepare it. They were to gather enough on day 6 to have for two days. On the seventh day, the Sabbath, they were to rest in their tents. God was providing for all of their needs--in proportion to what they needed. All they had to do was GATHER the food and FOLLOW HIS DIRECTIONS. Of course the Israelites made some mistakes along the way. Does that sound familiar? Do we do that over and over? I don't know about you, but I certainly find enough ways to "mess" up. But that is where the great part comes in! I can't tell you how many times I have studied this story--my whole life. But this time I GOT IT! It really did just hit me between the eyes! God provides the bread of heaven, but we also have a part in making the plan work. We have to GATHER the manna. When God offers something to us, he also expects us to DO something. Read these verses and see what God gives and the action we are to take. John 6:32-35 God gives "the bread of life" We must "come" to him and "believe"
Matthew 6:33 God gives "all these things" We must "seek"
Psalm 81:10 God will "feed" us We must "open our mouths"
Yes, He says, Open You mouth wide and I will feed you! I mean--How simple is that! How many ways can he say it, "Get ready, I'm going to take care of you! " 5. How is Christ clothed in Revelation 19:13? Christ is clothed in a robe that is stained with blood. Blood purifies and forgives. Because he wore clothes stained with blood we will wear "fine linen, pure and white" (Revelations 19:6-8). Praise God! God wants a relationship with us. He asks us for faithfulness and submission. He offers us eternal life and provides for us in wondrous ways! I am posting a summary each Wednesday based on the A Woman's Heart lesson my Monday night group is studying. We will be on Lesson Three next week. If you choose to post about your study for the week, please link here and leave a comment. You can adjust to the week I am on or post about the week's lesson you are studying. Whatever works for you! If you are reading along with us and do not choose to do your own post, please leave a comment here. We would like to hear from you also. Share the Word with us!